If you have suffered an injury at work or in a traffic accident, you need an attorney on your side who will put your needs first. You need an attorney from Hoggatt Law Office, P.C. At our office, we believe that being a small firm is one of our most important strengths because it allows us to become personally invested in every case and client we take on. When you choose our firm, you will not be just a number or the name on a case file. You are a real person with real problems, and you will be treated with dignity and respect. Our personal approach has helped us secure favorable outcomes for many clients in Berthoud, Larimer County, and the rest of northern Colorado, and we are ready to go to work on your behalf. Employees who are injured at work in Colorado are generally entitled to collect benefits through the state’s workers’ compensation system. Sadly, some employers and their insurance companies make collecting those benefits much more difficult than it should be. In some cases, they may downplay your injuries or claim that your injuries were not work-related. In other situations, insurers may simply delay payment, creating unnecessary problems for the injured worker. Injuries caused by equipment failure. Contact us today to get started on filing your claim for benefits. At Hoggatt Law Office, P.C., we have been representing victims injured in traffic accidents for more than 15 years. With more than two decades of combined legal experience, our attorneys understand the importance of conducting a full investigation into the circumstances surrounding your accident. We will determine exactly what happened and identify the party or parties who caused the crash. From there, we will do everything we can to hold those parties accountable and to get you the compensation you need. We are not afraid to get tough with insurance companies as we negotiate the terms of a settlement. However, we treat every case as if it is headed for trial. This allows us to negotiate from a position of strength at every stage of the process. To learn more about our firm, contact our office. 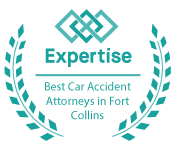 Call 970-225-2190 for a free, no-obligation consultation today. Our attorneys represent injured victims and their families in Berthoud, Larimer County, Weld County, and throughout northern Colorado.